Sometimes using a natural tee can take spin off your drives and hit it straight. Essentially the three components to a game of golf are the tee shot, iron play and the short game. If any one of these is lacking, you're not going to be able to score as low as you'd like. The tee shot sets up the rest of your game, so if you're not hitting your driver straight, be prepared for a long round. It may sound strange, but it will actually help you to not use a tee. This method takes spin off the ball, allowing you to hit it straight. Use your foot to loosen dirt on the tee box and mound it up so it creates a natural tee for your ball. The earthen tee should be low enough to relieve the spin yet high enough to get your ball airborne. Make a cup in the middle of the natural tee. This should be deep enough to cup the ball but not so deep and wide that it allows the ball to sit down in it. Place your ball on the tee. Your ball should sit as it would on a normal tee, supported, without any of the dirt or grass impeding the strike or flight of the ball. Set up your approach on the ball. The key is to have the ball come out low at impact so you'll want to move the ball back in your stance. You should be hitting off the insole of your back foot. Make your normal swing, but try to keep your club lower than normal through impact. The feeling is similar to hitting a punch shot. 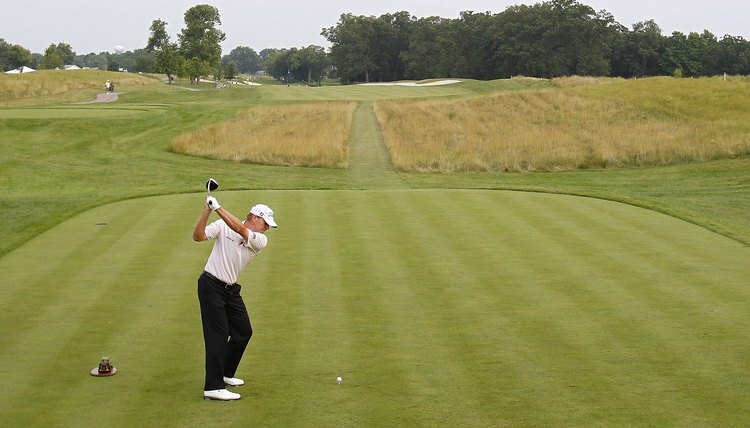 Does Tee Height Affect How Far You Can Drive?